This is the simple carrément chocolate all dressed up and ready for its star turn. It’s inspired by Pierre Hermé’s original – a shiny square of soft chocolate cake layered with chocolate mousse, chocolate cream, chocolate crunch and whisper-thin sheets of snap-at-a-touch chocolate, finished with a glossy chocolate glaze. My variation, which is doable by ordinary mortals, consists of a single layer of chocolate cake, cut in half, brushed with sugar syrup and filled with a chocolate pastry cream that could double as pudding. The cake is glazed with a dark chocolate ganache and topped with one of my favorite Pierre Hermé touches: salted-chocolate shards or cubes made of dark chocolate that is melted and salted, frozen and chopped. As its name declares, the gâteau is straight-out chocolate. It’s also a showstopper. But for all its bravura, it’s not difficult to make. The recipe is long and it looks like a lot of work, but it’s really just a series of simple steps that can be spread out over a couple of days. If you’re like me, you’ll love having a mini project that you can pick up again and complete when you’re free. And I know you’ll love the reward from time well spent. 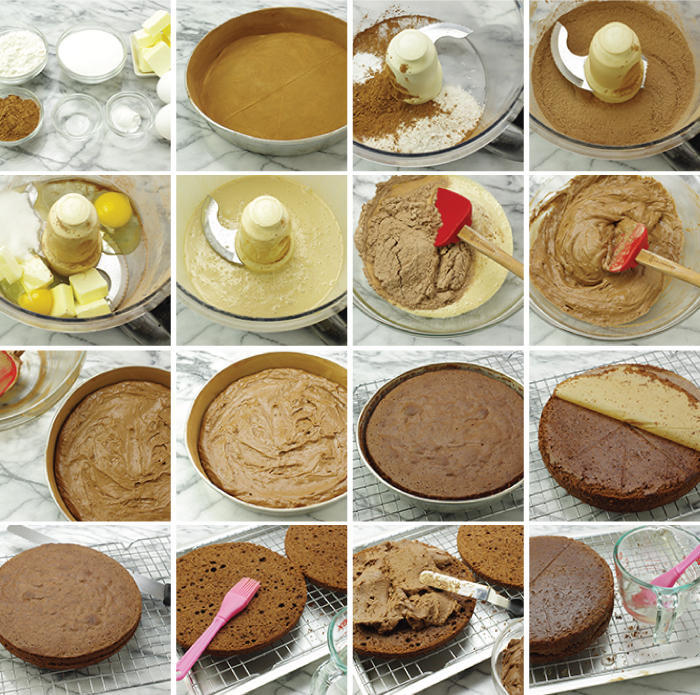 A WORD ON PLANNING: Each element in the recipe can be made ahead, and it’s good to put the cake together at least a few hours before serving so that the syrup can permeate the layers, and the filling and glaze can firm in the refrigerator. A WORD ON HEIGHT: In traditional French fashion, this cake is low. The recipe for the chocolate cake makes one very slim layer that you carefully slice in half before filling with pastry cream. If you’d like a taller gâteau, just double the recipe for the cake layer and bake it in two pans. Leave the layers intact, soaking each with the syrup and then filling them with cream. There’s no need to change anything else in the recipe. TO MAKE THE CAKE: Center a rack in the oven and preheat the oven to 350 degrees F. Butter an 8-inch round cake pan, one with sides that are at least 1-1/2 inches high, dust with flour and tap out the excess. 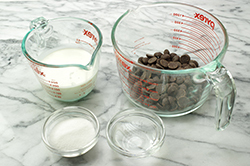 Put the pan on a baking sheet lined with parchment paper or a silicone baking mat. Put the flour, cocoa, baking powder and salt in a food processor and pulse several times to blend thoroughly. Turn the dry ingredients out onto a sheet of parchment or wax paper. Cut the butter into pieces and toss it into the processor, along with the sugar and eggs. Pulse the machine a few times to get things going, then process for 6 – yes, 6 – minutes, scraping down the bowl a couple of times, until the mixture is light, liquidy and full of bubbles. Gently scrape the mixture into a large bowl. 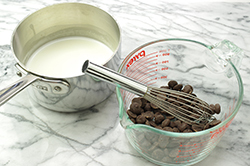 Add the dry ingredients to the bowl and, using a large flexible spatula, fold the two mixtures together gently and thoroughly. Scrape the batter into the prepared pan. TO MAKE THE FILLING: Bring the milk and 1-1/2 tablespoons of the sugar to a boil in a medium saucepan. Remove from the heat. Whisk the remaining 1-1/2 tablespoons sugar, the yolks, cornstarch and salt together in a medium bowl until thick and well blended. Whisking nonstop, drizzle in about 1/4 cup of the hot milk – this will temper, or warm, the yolks – and then, still whisking, add the remainder of the milk in a steady stream. Pour the mixture into the pan, put the pan over medium heat and whisking vigorously, constantly and thoroughly (make sure to get into the edges of the pan), bring to a boil. Keep at a boil – don’t stop stirring – for 1 to 2 minutes, then take the pan off the heat. 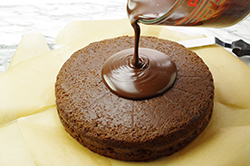 TO SOAK AND FILL THE CAKE: Put a cooling rack on top of a rimmed baking sheet lined with foil or parchment – your drip catcher. If you cake has crowned or domed on top, use a long knife and a gentle sawing motion to even it. Cut the cake in half horizontally. Put the top layer of the cake upside down on the rack and, using a pastry brush, brush it with half of the syrup (or use a spoon). Allow the syrup to soak in for a couple of minutes. TO FINISH THE CHOCOLATE SHARDS OR CUBES: Remove the salted chocolate from the freezer, peel away the plastic film and put the chocolate block on a cutting board. Working quickly, either cut the chocolate into slivers and shards of varying lengths and thicknesses, or chop it into cubes that are about 1/4 inch on a side. 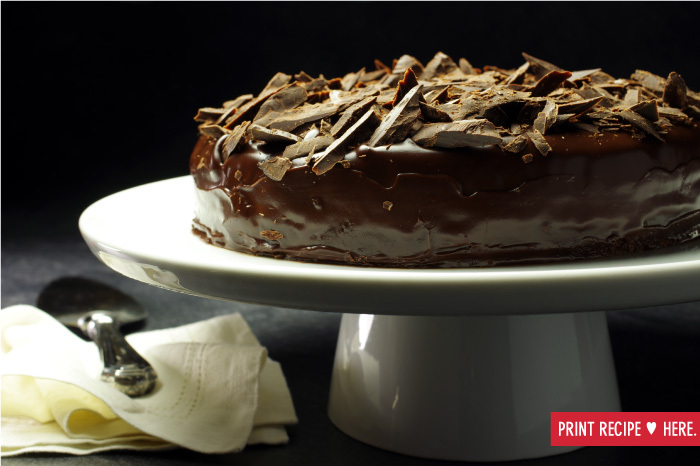 Don’t worry about evenness: The cake is prettiest when the chocolate is cut into different sizes and shapes. Return the chocolate to the freezer. TO FINISH THE CAKE: Set the chilled cake on a cooling rack over a lined baking sheet (just as when you soaked and filled it) and have a long offset icing spatula at hand. Working quickly, pour the glaze over the top of the chilled cake, allowing it to run down the sides. 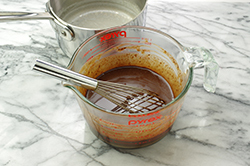 If the glaze needs a little help moving to the sides, use the spatula to send the glaze over the top. Then smooth the glaze around the sides of the cake. Don’t worry about how the top looks (although it’s probably gorgeous); most of it is going to be hidden. Remove the chocolate pieces from the freezer. If you’ve made slivers and shards, you can pile them on top of the cake or poke them into the cake so that they stand up. If you’ve made cubes, scatter them over the top of the cake and press them into the glaze with your fingertips. 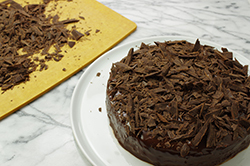 Small pieces of chocolate will no doubt fall off the cake and you may not use all the slivers, shards or cubes you’ve cut. If that’s the case, collect the tumblers and leftovers, wrap them in plastic film and freeze the. You’ll be happy to have them to sprinkle over ice cream or nibble as a snack. Return the cake to the refrigerator for at least 1 hour (or up to overnight) to set and chill. SERVING: The cake can be served cold, straight from the refrigerator, or at cool room temperature. And it can be served on its own, as a study in chocolate intensity, or served with this opposite: something white and creamy. 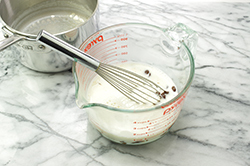 My favorite finish for the cake is a spoonful of unsweetened crème fraîche or sour cream. STORING: The cake and all its components can be made ahead. 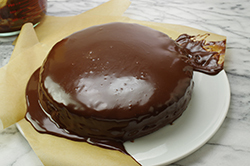 The cake can be made up to 1 day ahead and kept at room temperature or frozen for up to 2 months; the chocolate shards or cubes can be frozen for up to 1 month; the filling can be refrigerated for up to 2 days; the syrup can be refrigerated for up to 1 month; and the glaze can be refrigerated for up to 5 days (then warmed before using). Once the cake is put together, it can be refrigerated for up to 1 day or frozen for up to 2 months: Freeze it until it is firm and then wrap it airtight; thaw, still wrapped, in the refrigerator overnight.